As economies have slowed in North America and Europe, many countries in the Asia-Pacific have grown steadily. As a result, the number of wealthy individuals in the region has also continued to increase and Asia-Pacific for the first time has become home to the largest number of high-net-wealth individuals (HNWI) in the world. This rise of a small but surging population of wealthy individuals is particularly important to issuers of high-end financial products such as premium credit cards. The future of premium credit cards in Asia is undoubtedly bright due to strong economic growth and promising population demographics. Examining the current state of the premium segment in the region enables a deeper understanding of the status quo and strong strategic decisions for the future. Mercator Advisory Group’s new report, Premium Credit Card Opportunities in Asia-Pacific Markets, examines the state of HNWIs around the world and the Asia-Pacific market in particular. The research provides a broad understanding of the HNWI demographic, projects their growth in selected Asia-Pacific markets, and surveys premium credit card growth in the Chinese, Singaporean, Thai, Indonesian and Malaysian credit card markets. 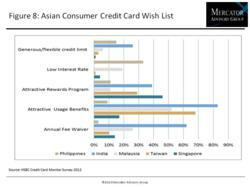 Also included is a breakdown of premium credit card trends and offers in Asia, a comparison to domestic counterparts, and a discussion of the opportunities and challenges of market expansion into Asia-Pacific markets. This report is 26 pages long and has 13 exhibits. Companies mentioned in this report include: American Express, Bangkok Bank, Bank of Queensland, Bukopin Bank, Capgemini, CIMB Bank, Citigroup, Commonwealth Bank of Australia, DBS Bank, HSBC, Huaxia Bank, ICBC, ICB Bumiputera Bank, Julius Baer, Krungthai Bank, MayBank, RBC, United Overseas Bank, and Visa. Members of Mercator Advisory Group’s International Advisory Service and Credit Advisory Services have access to this report as well as the upcoming research for the year ahead, presentations, analyst access, and other membership benefits. Please visit us online at http://www.mercatoradvisorygroup.com. For more information and media inquiries, please call Mercator Advisory Group's main line: (781) 419-1700 or send e-mail to info(at)mercatoradvisorygroup(dot)com. Follow us on Twitter @ http://twitter.com/MercatorAdvisor.